THIS IS IT!! A one-in-a million location! A rare island retreat that is situated where you can have your own mountain top experience of endless ocean, mountain and city vistas. Brand New Roof installed spring of 2015. Another spectacular Cliffside property! This is a turn key offering that comes with a 12 x 16 ft cabin, a large 15x12 ft deck, a 22 foot Kuston Koach trailer. Come enjoy living in it’s finest on this south-facing, high-bank waterfront with a 2,800 sq.ft home with year round sun. Views from this property overlook the picturesque Lyall Harbour, Plumper Sound and Mt Fischer. Island Charm! Perched on a hilltop on Saturna Island is a meticulously and lovingly built 2 bedroom, 1 bathroom home where the kitchen, dining and living areas open to the panoramic NW views of Lyall Harbour and the North Shore Mountains. MLS # V1122849. EASY CARE VIEW LOT. 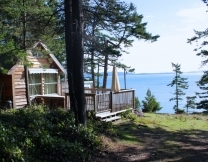 Enjoy expansive views of Lyall Harbour, Mayne Island and the north shore mountains. 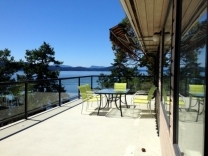 A lovely tri-level waterfront home with expansive views of Lyall Harbour, Mayne Island, the mountains north of Vancouver and the city Lights. Ready for you to build your dream home! This lot is set above Boundary Pass over looking south to the San Juan Islands. Watch the whales, seal, eagles, cruise ships & freighters. All day sun on this private, peaceful & perfect rural hideaway. Double your space and buy 182 Cliffside too! Incredible ocean front views & unique sandstone formations along the water's edge best describe this .048 acre lot on Cliffside. There is always something happening at the waters edge... whales, seals, eagles and ships passing by. Double your space and buy 180 Cliffside too! 187 East Point Road Water Front Farm House Grandeur! Overlooking picturesque Lyall Harbour this 10.48 acre 3,800 sq ft 5 bedroom 4 bathroom family home has been lovingly and meticulously updated to all modern standards and more! Waiting for your enjoyment. Experience million dollar views over Georgia Strait, looking to the grand Mount Baker, the Northshore Mountains and the twinkling city lights of Vancouver.